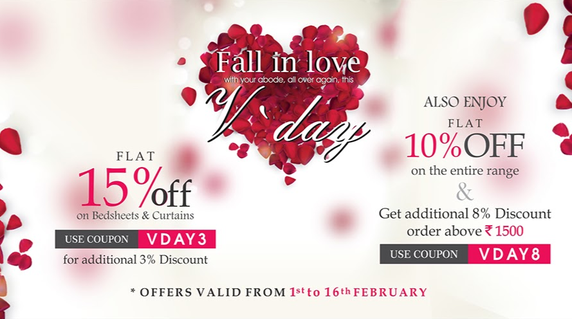 Swayam India is displaying their love on their customers by offering huge discounts. Get all your favorite bed linens and curtains at Flat 15% Discount. With additional 5% discount, you can transform the entire appearance of your home. Use the Code- VDAY5. You can also avail Flat 10% off on the rest of the products. Shop above Rs 1500 and get additional 10% Discount. By using the coupon Code- VDAY10, make your Valentine`s Day special.